Supernova is a part of a new collection of star designs from the Natural Dye Studio. Based at Exmoor, an international dark sky reserve, on a moonless night you can see forever into the galaxy. Issue 49 – in shops from today! 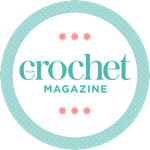 Take a peek at what we have to offer in issue 49, on sale from 27th December! Using stranded Tunisian colourwork, this versatile wrap is worked from hem to hem in one piece.